Reinventing plant-based eating is what Tal Ronnen is all about. At his Los Angeles restaurant, Crossroads, vegans, vegetarians, and carnivores sit side by side and eat dishes that satisfy each of them. Ronnen’s cooking is Mediterranean first—think warm bowls of tomato-sauced pappardelle, plates of spicy carrot salad, and crunchy flatbreads piled high with roasted vegetables—and vegan second. Ronnen proves that the flavours we crave are easily replicated in dishes made without animal products. 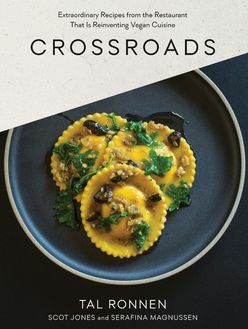 With accessible, unfussy recipes, Crossroads stresses simple preparations and fresh ingredients, and takes plant-based eating firmly out of the realm of hippie health food and into a cuisine that fits perfectly with today’s modern palate. After all, the backbones of Ronnen’s food—seasonal vegetables, beans, nuts, and grains—are what many of us are already eating daily. The recipes are photographed in sumptuous detail, and with more than 100 of them, this book is an indispensable resource for healthy, mindful eaters everywhere. A high-end vegan cookbook filled with inventive vegetable-focused recipes from Tal Ronnen, the most influential vegan chef working today, of Crossroads Restaurant, in Los Angeles.